Marshall A. Martin is a sole practitioner with an office in Scottsdale, Arizona. He represents clients in all areas of employment law, and has had extensive trial experience, including obtaining multi-million dollar jury verdicts in discrimination cases as well as numerous trial victories on behalf of employees against whom employers sought to enforce non-compete agreements. Mr. Martin has been named in Super Lawyers of the Southwest for 2007, 2008, 2009, 2013, 2014-2017. 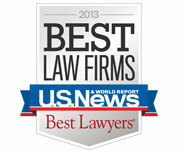 Mr. Martin has also been recognized in Best Lawyers in America from 2010 through 2017. 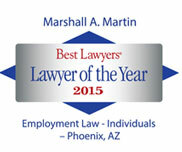 Named one of the "Best Law Firms" by U.S. News and World Report for 2011-2016, Mr. Martin was recognized as the 2015 Employment Lawyer of the Year in Phoenix by Best Lawyers in America. He received his B.A. from Doane College in 1981 and his J.D. from the University of Nebraska College of Law in 1984. He is admitted to practice in the states of Arizona, Alaska, Nebraska and before the Ninth Circuit Court of Appeals, United States Claims Court, and United States District Court. He is a member of the Labor and Employment Law section of the State Bar of Arizona. As a sole practitioner, Mr. Martin provides direct and personal service to each of his clients throughout every phase of a case, from the initial consultation through trial, and if needed, on appeal. Mr. Martin has 30 years of experience handling all types of employment matters in a variety of venues including administrative appeals, grievance hearings, state and federal courts and at the appellate level. The Law Office of Marshall A. Martin makes a firm commitment to fully inform each client of the status of their case at each step in the process, to always re-evaluate the merits of each matter, and to promptly respond to any client inquiry, typically within one day. Mr. Martin communicates frequently with other employment law attorneys to draw on a broad base of expertise and experience, so as to better serve client needs. Marshall Martin was extraordinary thorough in his research, preparation, review of details of case with me and in his preparation and presentation at every step of his representation of my case. Marshall's knowledge, skill and experience made every penny spent worthwhile. I had specific concerns and fears, and I felt that they were understood and addressed throughout the process. Updates were timely and options were explained thoroughly. I felt confident that my best interests and those of my family were always in mind. I am very satisfied with the end result and will not hesitate to call again if there is ever again a need.